The Plott Hound is a treeing dog, meaning it was developed to track it's prey and then force the animal into a tree. Once it is treed the dog will continue to bark or bay until the hunter makes the kill or the dog is called off. 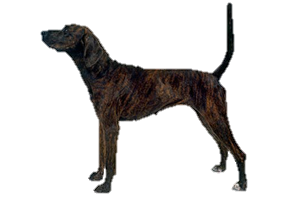 Unlike the other traditional coonhounds the Plott Hound is regularly used to hunt ground game as well. They hunt boar or bear most often, but they are also adapt at hunting smaller prey such as raccoon. The history of the Plott Hound begins in 1750, when two young brothers emigrated from Germany to America. Like many emigrants they brought with them their dogs, in this case five Hanoverian Hounds. One of the brothers died on the way, but the other, Georg Plott, settled in North Carolina. Hanoverian Hounds were used to hunt boar most often, however he quickly found that they were experts at treeing Black Bear. He began to selectively breed his dogs, making adjustments so they became more suited to his new homeland and his decedents closely guarded them for the next seven generations. Only one official out cross has been made in over 200 years, with a dog known as a Belvin to help strengthen the line. This makes the Plott Hound one of the purist coonhound (and purebred) strains. Is the Plott Hound Right for You?